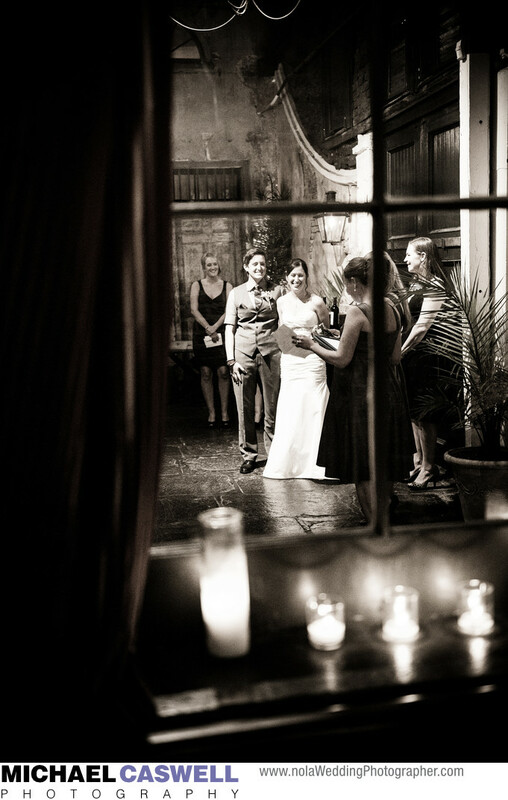 Another great shot of a wedding ceremony at Latrobes on Royal in the French Quarter, this one a bit more moody and dramatic, captured through the window of the carriageway adjacent to the fully enclosed and climate-controlled courtyard that is used for ceremonies. Latrobes has loads of character, and I always enjoy photographing there. The amazing New Orleans wedding venue also features a spacious main ballroom where most of the reception action occurs, though the courtyard room is also usually reconfigured immediately after the ceremony to provide alternate reception space for guests who want a quieter place for conversation with old friends or family members, away from the music and action of the main ballroom.